Region: Western United States with species distributed in the South and West. Life cycle: This particular beetle produces numerous generations each year and overwinter as adults. Physical Description: This lady beetle has bright red or orange wing covers with very few or no markings at all. The head is black with white marks just behind it head. This beetle ranges from 1/10 to 1/4 inch long. The eggs are orange and are laid in the upright position in clusters on leaves and stems. The larva is a grayish color with a flattened body with wrinkles. 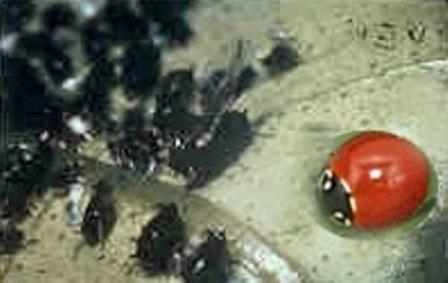 Feeding characteristics: The lady beetle, both the larvae and adult, will eat Aphids, Scales, and Mealybugs. Controls: No controls are required. The lady bug beetle is a welcomed insect.